Gallia Academy senior Kaden Thomas (12) dribbles past a Rock Hill defender during the second half of Tuesday night’s OVC boys basketball contest in Centenary, Ohio. CENTENARY, Ohio — Sometimes the best offense is a good defense. 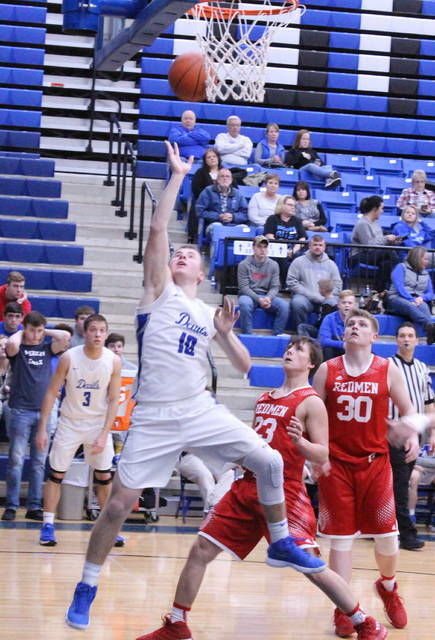 The Gallia Academy boys basketball team limited visiting Rock Hill to 33 percent shooting and forced 17 turnovers on Tuesday night en route to a 60-35 victory in an Ohio Valley Conference contest in Gallia County. The Blue Devils (12-1, 6-1 OVC) never trailed and shot 48 percent from the floor while picking up their seventh consecutive victory of the season. The hosts also claimed a season sweep of the Redmen (0-12, 0-7) after posting an 82-35 decision in Pedro back on Dec. 12, 2017. The Blue and White closed the final 1:23 of the first period on a 5-0 run that led to an 11-4 cushion after eight minutes, but RHHS answered with seven straight points to start the second canto and knotted things up at 11-all with 5:11 left. Gallia Academy took a permanent lead following a Cory Call basket at the 4:57 mark, and the hosts built a trio of four-point cushions before a Logan Hankins trifecta with 2:36 remaining pulled the Red and White back to within 19-18. The guests, however, were never closer as the Blue Devils closed the final 1:41 with four consecutive points from Justin McClelland while securing a 23-18 cushion headed into the break. 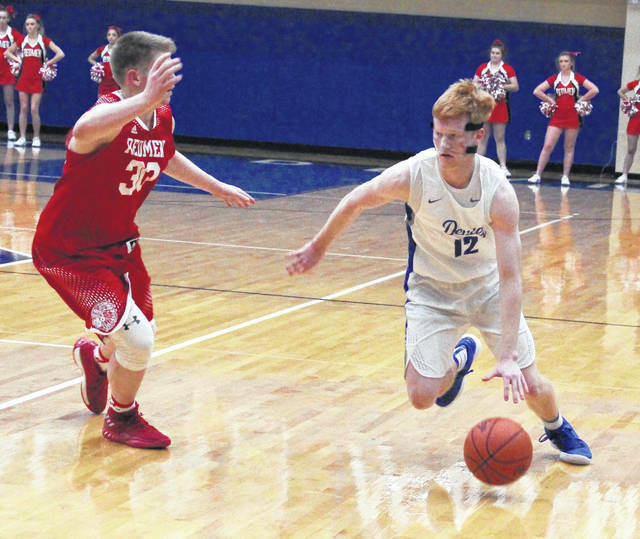 Gallia Academy shot 48 percent from the field and committed only three of the 10 total turnovers in the first half, yet struggled to build only a two-possession lead at halftime. A big reason for that discrepancy came down to hustle plays and sometimes even luck, as every loose ball managed to find the Redmen. Rock Hill — which shot only 8-of-26 from the field in the first half — outrebounded the hosts by a 17-10 overall margin before halftime, including 9-2 on the offensive glass. Braden Stamper capped a small 4-2 run with a basket at the 5:29 mark that allowed RHHS to close to within a possession at 25-22, but the hosts answered with a 16-5 surge over the final 5:10 en route to a 41-27 advantage headed into the finale. The Blue Devils led by double digits over the final 9:15 of regulation and closed the fourth on a 19-8 charge to wrap up the 25-point outcome — the largest lead of the night. After a big road win at Chesapeake on Friday and a solid home win over Washington Court House on Saturday, GAHS coach Gary Harrison was a little concerned about his team’s energy level headed into Tuesday night — particularly against a winless squad that the Blue Devils had already beaten by 47 points five weeks ago. It had all the makings of a perfect trap game, but the Devils’ defense ultimately didn’t let that happen. “We’ve played three games in five days and that may have gotten us a little bit early on, but I thought our defense was solid from the start. To only give up 18 and 17 points in each half is something I’m proud of tonight,” Harrison said. “Rock Hill may not have a win, but they play hard and they play aggressive — and my hat’s off to them for their effort tonight. Rock Hill outrebounded the hosts by a 35-24 overall margin, including an 11-4 edge on the offensive glass. Gallia Academy, however, committed only seven of the 24 turnovers in the contest. The Blue Devils connected on 24-of-50 field goal attempts overall, including a 4-of-11 effort from three-point range for 36 percent. All four of the Blue and White’s trifectas came after the intermission. Zach Loveday — a 7-foot sophomore — led GAHS with a double-double effort of 17 points and 15 rebounds, both of which were game-highs. Loveday also recorded eight blocks in the triumph. Call was next with 14 points and three rebounds, while McClelland chipped in a dozen markers. Kaden Thomas added five points and Caleb Henry also had four points. 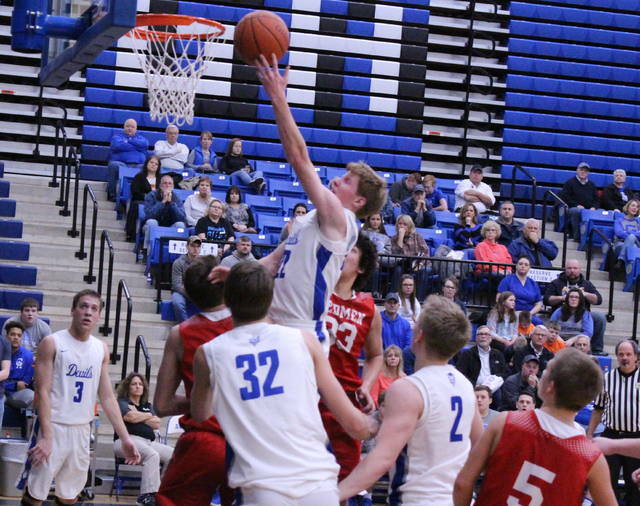 Blaine Carter and Gage Harrison recorded three points apiece, with Evan Wiseman rounding things out with two points. The hosts were 8-of-17 at the free throw line for 47 percent. Rock Hill netted 16-of-48 shot attempts overall, including a 2-of-14 effort from behind the arc for 14 percent. The guests were also 1-of-10 at the charity stripe for 10 percent. Hankins, Stamper and Kadin France paced the Redmen with eight points apiece, followed by Jake Blagg and Garrett Miller with four points each. Jaret Bacorn completed the RHHS tally with three points. France led the Red and White with 11 rebounds, while Stamper and Bacorn each hauled in seven boards in the setback. With a pair of big OVC contests looming this weekend with Ironton and Portsmouth, Harrison believes now is the time for his troops to find another gear — even though they are off to the school’s best start in well over a decade. 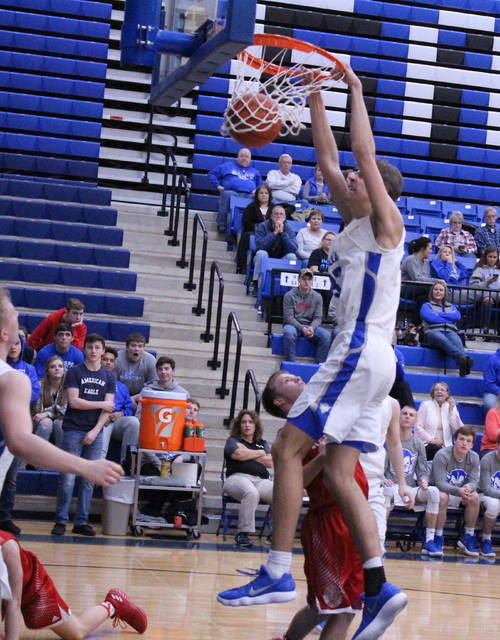 The Blue Devils travel to Ironton on Friday night and will host Portsmouth on Saturday. Both OVC contests will tipoff at approximately 7:30 p.m.